The Draper City office is open from 8:00 am to 4:00 pm Monday through Friday, closed on Saturday and Sunday. Please plan to arrive well before the 4:00 pm closing time so that your passport can be processed. The processing time per passport is approximately 15 minutes. The office is located on the first floor of Draper City Hall, 1020 East Pioneer Road, Draper, Utah. Fill out a Passport Application for each person applying for a passport. 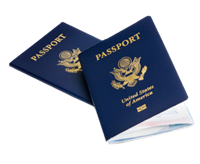 You can fill out and print an application online US Passport Application or fill out a written application in the Draper City Passport office. Each person applying for a passport must be present, including minors. A Passport photo is required. Draper City can take your photo for $10.00 per photo. The US State Department has issued a new photo passport requirement. Effective November 1, 2016 passport photos of customers wearing eye glasses will not be accepted except under special conditions. 6. You must bring in a check (Personal or business check, cashier check, counter check or money order). This check must be made payable to the U.S. Department of State. 7. For your acceptance fee and any photo fees, you can pay by check, credit card, debit card or cash. Passport Requirements for Minors Under Age 16. Minors need to come in with their parent(s) in order to apply for a passport. Both parents must be present unless one parent has filled out a State of Consent (form 3053). You must bring a birth certificate for each child. You must bring in each child's expired passport if they were issued one. For children under age 16, you pay minor passport application fees. A minor's passport is valid for five years. Passport Requirements for Minors age 16 and 17. Minors are able to apply independent of parents if they are able to submit sufficient photo ID or evidence of parental awareness (check from parent). Minor must bring in his or her expired passport if they were issued one. For minors age 16 or 17, you pay adult passport application fees. Passport is valid for ten years. The average processing time for passports is six weeks. Expedited applications take three weeks. * Passport cards are valid for land and sea entry only into Canada, Mexico, Bermuda, and the Caribbean. They cannot be used if you plan to fly to one of these destinations. Check on the status of your application at: www.travel.state.gov/passport Please allow 7 days for your passport information to show up online.